I’m pleased to announce that starting this month, the National Journal Writing Month writing prompts will be hosted on the Teachable platform. As part of each NaJoWriMo month (January, April, July, and October), participants can choose to use set of writing prompts centered on a particular theme for each month. When a theme set is ordered, recipients will receive in their inbox daily journal writing prompts for the entire month of NaJoWriMo. Previously, all the journal writing prompts have been hosted on the Gumroad platform, but starting this month I’m switching all the themes over to Teachable. Though Teachable costs more to host courses, the platform seems to provide a better service than Gumroad. In the past few NaJoWriMo months, a few NaJoWriMo writing prompt customers have complained that they were not receiving their prompts on a daily basis. So I’ve switched to Teachable to hopefully rectify that problem. Teachable also allows for customers to view all the prompts in their Teachable account. So even after an NaJoWriMo month has ended, the prompts will still be available to customers. In addition, Teachable allows for NaJoWriMo participants to pre-order prompts instead of having to wait and order the day before a NaJoWriMo begins. And equally important, Teachable allows customers to leave comments about individual writing prompts. This is very useful for allowing me to know which prompts customers found useful. The upcoming NaJoWriMo theme for October, Unleashing the Creative Mind is now posted on the Teachable platform. Starting today and until September 29th, the October theme can be pre-ordered for just $8 (Note: us the coupon code: NaJoWriMo20)The first journaling prompt will arrive in your inbox on October 1st. In the next few months, the other NaJoWriMo themes will be added to the Teachable platform. I’m also pleased to announce the release of a new set of prompts that focus on the topic of happiness. This course is based on the popular book, The Happiness Project, by Gretchen Rubin. As you respond to the 35 daily journaling prompts for this course, you will explore what happiness means to you, and because you’re using journal writing you’ll gain more insight about happiness in your own life. Happiness is sometimes difficult to define, but as I read Gretchen’s book, and started developing prompts for this course I realized that what it means to be happy is based on how we view our life and how we view what brings us joy. Sometimes we don’t always stop and think about what makes us happy. We know that when we’re laughing and having a good time that we mostly feel happy, but if you reflect on happiness, you’ll discover there’s many other, often subtle ways to know what happiness means to you. Writing and reflecting about happiness also reveals what causes us to feel happy in certain situations and experiences. 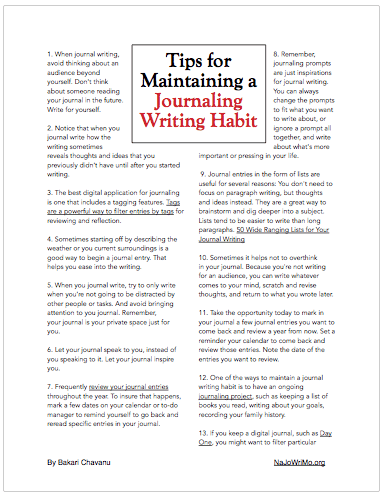 The benefits of journaling about happiness helps us write about our own experiences and views of happiness similar to how Gretchen wrote in her book on the subject. I look forward to getting feedback about what you learn in journaling about happiness. It’s important subject for any time of our life. Let me know in the comment section below what you think about this theme of happiness for journal writing.